The 15th Alabama Volunteer Infantry Regiment was organized at Fort Mitchell, Alabama, in August 1861, with eleven companies recruited from Barbour, Dale, Henry, Macon, Pike, and Russell counties. With over 900 men, the regiment was moved into East Tennessee and then Virginia. It joined the main army near Manassas and was brigaded with the 21st Georgia, 21st North Carolina, and 16th Mississippi Regiments under Maj. Gen'l G. B. Crittenden of Kentucky (Brig. 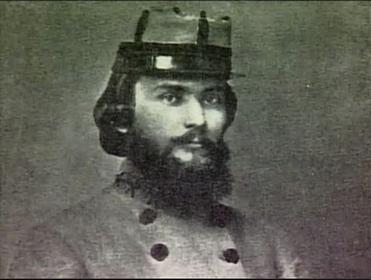 Gen'l Isaac R. Trimble succeeded Crittenden in December). When the army moved over to Yorktown, the 15th remained on the Shenandoah in Maj. Gen'l Thomas J. 'Stonewall' Jackson's Division to participate in the Valley Campaign. It was engaged with slight loss at Front Royal (23 May 1862) and Winchester (25 May), but it lost 9 killed and 33 wounded out of 425 engaged at Cross Keys (8 June). Moving over to Richmond in Jackson's flank attack against Union Maj. Gen'l George B. McClellan, the 15th entered the first battle of Cold Harbor (27-28 June) with 412 men and lost 34 killed and 110 wounded. The regiment suffered slightly at Malvern Hill on 1 July. It was engaged at Hazel River (22 August) and at Manassas Junction with a loss of 6 killed and 22 wounded. The 15th Alabama participated in the 2nd Battle of Manassas (30 August), losing 21 killed and 91 wounded out of 440 men engaged. At Chantilly (1 September), the regiment lost 4 killed and 14 wounded and took part in the investment of Harper's Ferry, with trivial loss. At Sharpsburg (17 September), of 300 men engaged, 9 were killed and 75 wounded. Under fire at Fredericksburg on 15 December, the regiment had casualties of one killed and 34 wounded. The 15th Alabama was placed in the Alabama Brigade under Gen'l Evander McIver Law (with the 4th, 44th, 47th and 48th Alabama regiments) on 19 January 1863. On detached duty at Suffolk until May, the regiment lost 4 killed and 18 wounded. Later that summer, the regiment took part in the assault on Gettysburg (1-3 July) with Hood's Division, and within a few minutes lost 72 killed, 190 wounded, and 81 missing of the 644 men engaged. The 15th suffered lightly at Battle Mountain, and, transferred to the West with Braxton Bragg's army, fought at Chickamauga (19-20 September), where it lost 19 killed and 123 wounded, out of 425 engaged. In the fierce fights at Brown's Ferry (27 October) and Lookout Valley, the regiment lost 15 killed and 40 wounded. At Knoxville (17 November-4 December), 6 were killed and 21 wounded; at Bean's Station (14 December), losses were slight. In 1864, the 15th took 450 men into the fight at The Wilderness (5-7 May) and Spotsylvania (8-18 May) where it lost 18 killed and 48 wounded. At Hanover Court House (30 May) and the 2nd Battle of Cold Harbor (1-12 June), the loss was 6 killed and 16 wounded. During the Petersburg defense, the 15th lost a third of its 275 men at Deep Bottom (14-18 August), and at Fussell's Mill, the loss was 13 killed and 90 wounded. The 15th took part in the subsequent severe fighting and surrendered 170 men at Appomattox. Of 1633 on the rolls, over 260 fell in battle, 440 died in the service, and 231 were transferred or discharged.